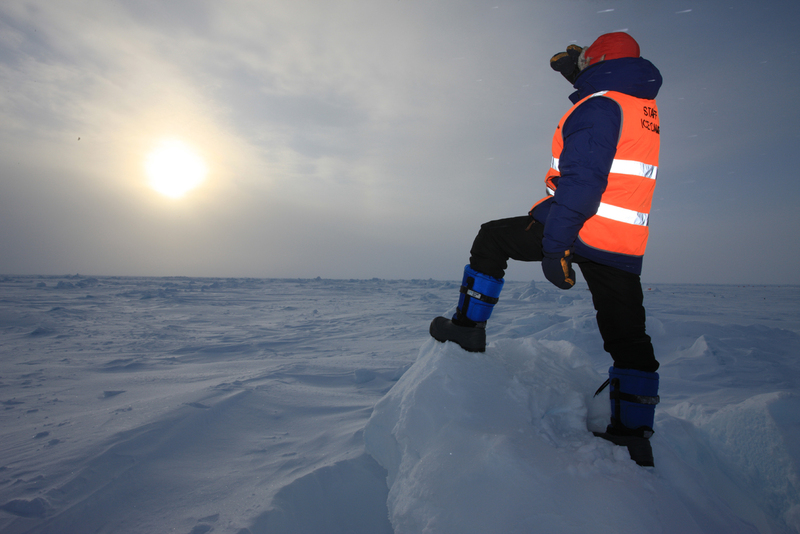 The high-tech footwear was successfully tested at the Barneo station in the Arctic. New cold-resistant boots made in Siberia can withstand extreme cold of up to -70 Celsius (-94 Fahrenheit). Tests at the Barneo station in the Arctic have already proven successful. Scientists in Novosibirsk recently unveiled the innovative cold-resistant Pioneer of Arctic Travel boots that can withstand temperatures of up to -70 Celsius. Scientists used nanotechnologies to create a "thermos effect" for the sole. The high-tech footwear was successfully tested at the Barneo station in the Arctic, and they will also be available for civilians interested in extreme sports and tourism. The boots have been three years in the making, starting in 2013 when the manufacturer established a scientific research center staffed by organic chemists who experimented with modified polymers. For example, ethylene-vinyl acetate, when combined with nano-pipes, gives the innovational boots their special qualities. To avoid punctures and slipping the inventors used thermoplastic elastomers. "Our primary goal is to develop new footwear materials to improve durability, lightness, cold-resistance and other qualities," said Natalya Pauli, an official at the manufacturer, Obuv' Rossii (Footwear of Russia). "The researchers created a new material that was tested at the Novosibirsk Technological Institute, and an experimental batch was sent to the Barneo station where experts tested our footwear in real Arctic conditions." Polar scientists then gave their feedback and the company improved the footwear, preparing some models for the military. Orders for the boots have also been received from state agencies, such as the Ministry of Emergency Situations, and the first 50,000 pairs have been shipped. "In the beginning of the year the government banned the import of light industrial goods for state and municipal needs," explained Pauli. "As a result, a new market has opened for Russian footwear manufacturers whose annual volume is around $2.4 billion, with sales of 50 million pairs of shoes." Obuv' Rossii plans to widen the scope of its market and position the Pioneer of Arctic Travel boots for those who are active in outdoor recreation, hunting and fishing. In social networks users from Siberia were curious to know if the company will develop nano-coats and nano-hats, but for now the company said that it won't be making these items. "We plan on producing special footwear that has protective features: fire-resistance, super-durability," said Pauli. "High-tech materials are also used for this."